In front of a crowd of 23,149 fans, France lifted the FIVB Volleyball World League trophy for the second time of their history, prevailing on an epic battle over hosts Brazil 3–2. This marked the fifth time in the last seven editions with Brazil reaching the final without successfully winning the gold medal. Canada wrapped up their best ever World League campaign by seizing the bronze medal (their first medal at an international FIVB event) after coming from behind for a 3–1 win over United States. Earvin N'Gapeth was elected the Most Valuable Player for the second time, after also being the MVP in 2015. Slovenia defeated Japan in the Group 2 finals in Gold Coast, Australia to achieve their second straight group title since their debut last year (the team had previously won the Group 3 in 2016). Moreover, Estonia finished atop of Group 3 at their first ever World League participation after a convincing 3–0 win over Spain in the final match in León, Mexico. On 11 June 2017, the new one-set-score world record for national teams was established in the Group 3 intercontinental round match between Qatar and Venezuela. They spent 49 minutes in a 45–43 third set that was won by Qatar. The previous highest set score was 44–42, which had happened twice (in the 1999 FIVB Volleyball World League match between Canada and Brazil, and in the 2016 World Olympic Qualifying Tournament match between France and Australia). Excluding Cuba and Puerto Rico, who withdrew from the tournament, the remaining 34 teams from the 2016 edition directly qualified. Estonia and Austria qualified through the 2016 European League. 1 Teams making their debuts. Group 1, the 12 teams were drawn in 9 pools of 4 teams. In each pool, all teams will compete in round robin format. The results of all 9 pools will combine in 1 ranking table. The hosts and the top five ranked teams will play in the final round. The last ranked team after the Intercontinental Round could be relegated if the winners of the Group 2 Final Round can meet the promotion requirements set by the FIVB. Group 2, the 12 teams were drawn in 9 pools of 4 teams. In each pool, all teams will compete in round robin format. The results of all 9 pools will combine in 1 ranking table. The hosts and the top three ranked teams will play in the final round. The last ranked team after the Intercontinental Round could be relegated if the winners of the Group 3 Final Round can meet the promotion requirements set by the FIVB. Group 3, the 12 teams were drawn in 6 pools of 4 teams. In each pool, all teams will compete in round robin format. The results of all 6 pools will combine in 1 ranking table. The hosts and the top three ranked teams will play in the final round. Group 1, the 6 teams in the final round will be divided in 2 pools determined by the serpentine system. The host team will be at the top position and the other teams will be allocated by their rankings in the preliminary round. The top 2 teams from each pool will play in the semifinals. The winning teams will play in the final match for the gold medals. Group 2 and Group 3, the host team will face the last ranked team among the qualified teams in the semifinals. The other 2 teams will play against each other in the other semifinal. The winning teams will play in the final match for the gold medals and a chance for promotion. The pools were announced on 13 September 2016. All times are Moscow Time (UTC+03:00). All times are Eastern European Summer Time (UTC+03:00). All times are Argentina Time (UTC−03:00). All times are Turkey Time (UTC+03:00). All times are Eastern European Time (UTC+02:00). All times are West Africa Time (UTC+01:00). All times are Central Daylight Time (UTC−05:00). The statistics of each group follows the vis reports P2 and P3. The statistics include 6 volleyball skills; serve, recept, set, spike, block, and dig. The table below shows the top 5 ranked players in each skill by group plus top scorers as of 24 June 2017. Best scorers determined by scored points from spike, block and serve. Best spikers determined by successful spikes in percentage. Best blockers determined by the average of stuff blocks per set. Best servers determined by the average of aces per set. Best setters determined by the average of running sets per set. Best diggers determined by the average of successful digs per set. Best receivers determined by efficient receptions in percentage. ^ a b c d "Olympic final rematch confirmed as 2017 World League draw completed". FIVB.org. 13 September 2016. Retrieved 13 September 2016. 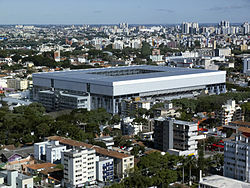 ^ a b "Brazil to host 2017 World League Finals in Curitiba's Arena da Baixada Football Stadium". FIVB.org. 6 March 2017. Retrieved 6 March 2017. ^ "N'Gapeth does it again as France shut down Brazil to clinch World League gold". FIVB.org. 9 July 2017. Retrieved 9 July 2017. ^ "Captain Perrin leads Canada to first-ever World League medal". FIVB.org. 9 July 2017. Retrieved 9 July 2017. ^ "France crowned for the second time in FIVB Volleyball World League". FIVB.org. 9 July 2017. Retrieved 9 July 2017. ^ "The amazing N'Gapeth strikes again and leads World League Dream Team". FIVB.org. 9 July 2017. Retrieved 9 July 2017. ^ "Gasparini, Vincic aces way for Slovenia to seal Group 2 title". FIVB.org. 25 June 2017. Retrieved 25 June 2017. ^ "Scoring trio spearheads Slovenia's second straight World League group title win". FIVB.org. 25 June 2017. Retrieved 25 June 2017. ^ "Blocking machine Kreek leads Estonia to Group 3 top spot". FIVB.org. 18 June 2017. Retrieved 18 June 2017. ^ "Gold Coast to host Group 2 Finals". FIVB.org. 16 December 2016. Retrieved 19 February 2017. ^ "World League Group 2 Finals". Volleyball Australia. 19 February 2017. Archived from the original on 20 February 2017. Retrieved 19 February 2017. ^ "Group 1 statistics". FIVB.org. 18 June 2017. Retrieved 19 June 2017. ^ "Group 2 statistics". FIVB.org. 18 June 2017. Retrieved 19 June 2017. ^ "Group 3 statistics". FIVB.org. 18 June 2017. Retrieved 19 June 2017. Wikimedia Commons has media related to FIVB World League.